After rescuing Julian from a death sentence, Lena and her friends fled to the Wilds. But the Wilds are no longer a safe haven—pockets of rebellion have opened throughout the country, and the government cannot deny the existence of Invalids. Regulators now infiltrate the borderlands to stamp out the rebels, and as Lena navigates the increasingly dangerous terrain, her best friend, Hana, lives a safe, loveless life in Portland as the fiancée of the young mayor. Requiem is told from both Lena’s and Hana’s points of view. The two girls live side by side in a world that divides them until, at last, their stories converge." I seriously need this book! I just need to know what is going to happen, especially with Alex. I just adore him. Dying to know what is coming next, especially with that killer cliffhanger. 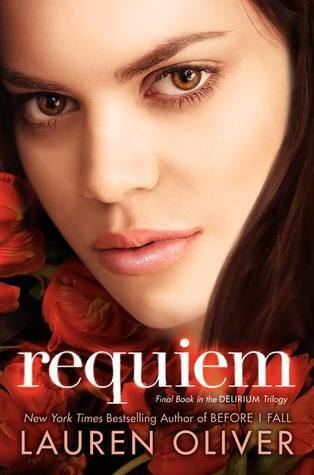 Requiem will be released on March 5, 2013. I'm so so excited to read this! Excited and scared to see how it all ends! I love Alex! Oh yes! More Alex fans! I am seriously worried about him in the next book! Ooh nice! Seeing this a lot! Lauren Oliver is such a dope lady and I love this series. Great pick! Ha. I need to catch up with Pandemonium, but since I already know how that book ends, I've been putting it off until Requiem is FINALLY out so I can read them back-to-back. Cannot wait! I recently got my hands on a copy of the first book in this series so have to start reading soon! I have this one, and don't hate me, but I just can't seem to pick it up and start. I'm terrified its going to end badly!!! Great pick! I'm definitely excited for this one too. I really like this series and I'm looking forward to reading what will happen next! *gasp* I still need to start this series! I think I'm waiting to read all three consecutively. Love the cover! Never heard of this series. Sounds good. This is definitely on my TBR list!! I love the cover!! I started Delirium and got to like chapter 6 and then got bored. Please please please tell me it gets better from that? I'm seriously not motivated right now.. It gets so much better! It is a slow start but it does pick up! Requiem should be amazing. I can't wait to read it. Great pick!